Interdisciplinary project presented within the exhibition “Commoning Cities” of the Seoul Biennale of Architecture and Urbanism, at the Dongdaemun Design Plaza (DDP), designed by architect Zaha Hadid. Project curated by Melina Nicolaides, ACTIVATE, and produced in collaboration with the “Alexandria and Mediterranean Research Center” and the “Center for Sustainable Development Studies” of the Bibliotheca Alexandrina. Today, the coastal city of Alexandria faces a combination of urban and environmental challenges. In this context, the project aimed to pose questions about the mechanisms that will be required for the city to face its current economic and infrastructure concerns, its continued population growth, and increasing environmental vulnerabilities. 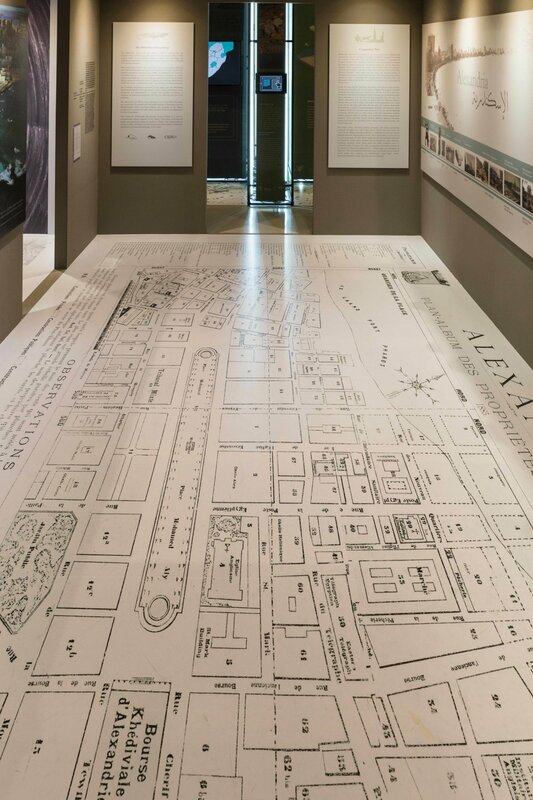 By juxtaposing the critical reality of the present to the city’s historic past and potential future existences, this project illustrated how the undetermined outcome of current city conditions will ultimately define the urban identity of the Alexandria of tomorrow. Stills from the video "Alexandria and its Challenges"
Seafront of Alexandria, facing the Eastern Harbor with its 15th century Fortress of Qaitbey, built on the site of the legendary Pharos - Alexandria’s ancient lighthouse - one of the seven wonders of the ancient world. Visible is the West Harbor which handles most of Egypt’s commercial shipping and foreign trade. Source: AlexMED, Bibliotheca Alexandrina. The legendary metropolis and enduring city of Alexandria was founded in 331 BC alongside the waters of the Mediterranean Sea by Alexander the Great. It was designed by his architect and urban planner, Dinocratis, to be the capital of Egypt and of the ancient world. Today, as Egypt's second-largest urban center, with a population of six million people, it is a major industrial hub, with a seaport that handles four-fifths of the country’s national trade. Over the city’s two millennia of urban evolution, this historically multicultural center of knowledge and exchange has cycled through stages of rebirth and collapse and has experienced an untold number of existential and physical transformations. This project juxtaposes the city’s past, present, and possible future existences. It will serve to illustrate that the undetermined outcome of current urban challenges and rapidly changing environmental conditions will ultimately define the future identity of this city. In this present-day era of vulnerability, priority must be given to envisioning a new model of Alexandrine urbanism for the years to come. In the city’s more recent past, Alexandria experienced an urban revival, beginning in the early 19th century. At that time, the city developed into a model of intercultural exchange, pluralism and tolerance, and it had a reputation for bustling cosmopolitanism. The onset of the 20th century, however, represented a turning point characterized by an unprecedented city sprawl. This resulted in a combination of human and architectural ataxia—an urban disorder that continues today. An ongoing interplay of demolition and development brought on the contemporaneous spread of concrete buildings and the ruin of much of the city’s distinctive architectural heritage. Modified human activity, occupational and population shifts, including refugee and displaced rural communities, brought compulsory alterations to urban settlements in order to meet the housing demands of the city. Waves of construction associated with ongoing variations in the socio-economic identity of the city and its residents continue to force unplanned physical changes on the city’s structure and damage the city’s urban character. Today, the city of Alexandria faces challenges resulting not only from the human influence of this hasty and unsystematic expansion, but also from the increasing environmental threats of climate change. Always strongly linked with the sea, contemporary Alexandria is suffering the consequences of its distinctive coastal location. As an “exposed zone,” it is considered a living example of the physical impacts of climate change and extreme weather events. These include extreme rainstorms and flooding, rising sea levels and the effects of saline intrusion into its coastal aquifers—issues also faced by other urban centers situated along the Mediterranean. Within this current urban reality, these parallel challenges affect both people and places in Alexandria. Alexandrian streets, which are increasingly seawater- flooded following high-intensity storms, affect work and living spaces and endanger historic monuments and the archeological sites of Alexandrine cultural heritage. Just as rising seas and powerful wave surges erode waterfront beach areas and the seaside “corniche” road—both traditionally part of the daily lives of Alexandria’s residents—the barrier walls around the historical Eastern Harbor are also experiencing the physical repercussions of these environmental forces. These combined factors have distressed Alexandria’s already crumbling infrastructure, exposing the city’s urban flaws and its vulnerable coastline. Extreme rainfall event of October 2015. A flooded downtown Alexandria. People walking ontop of a submerged wall along the 'corniche' road. City traffic in floodwater along the seafront, by the Bibliotheca Alexandrina building. Source: Center for Sustainable Development Studies, Bibliotheca Alexandrina. As an insight into the city’s future, this project will look at strategies for both adaptation and transformation, specifically through a campaign and design competition to promote a preservation project for the Eastern Harbor. 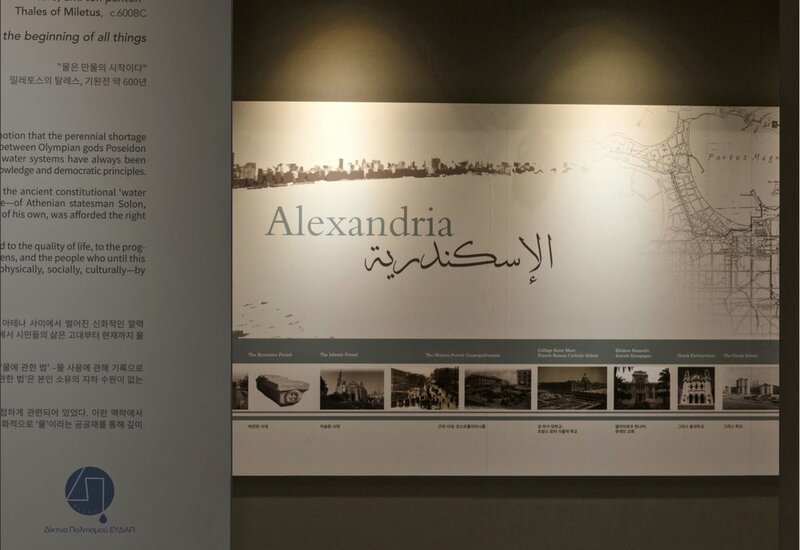 This site represents a principal feature of the city’s founding design, which not only symbolizes the different historical phases in the development of the city, but also remains the most important spot identified with Alexandria’s waterfront. A series of proposed mega-development projects fostered under the auspices of the Bibliotheca Alexandrina—in its historically influential role and active engagement with the progressive advancement of the city—proposes a new vision for the urban Alexandria of the 21st century. View of the ‘corniche’ road showing the proximity of the sea waves to the city, and its vulnerability to the coastal implications of climate change. Determining the future of Alexandria will require an approach that integrates core solutions to its current challenges of urban adaptation and coastal management, while also preserving the city’s historical and architectural legacy. The forthcoming Alexandria must evaluate the scale of its present vulnerability and transform its dire economic, environmental and technological obstacles. However, for this “eternal city” to ensure a bright future that will be on par with its illustrious past, it must formulate creative and human-centered responses that go beyond city planning—which might initiate the birth of a new urban Alexandrianism for its next generation of citizens. Historical photographic images used in the project are courtesy of the Bibliotheca Alexandrina and of the Awad Collection.